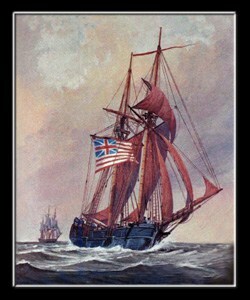 In July 1779, British Major General William Tryon and 2,600 men embarked onto a Royal Navy fleet led by Admiral George Collier, and raided the Connecticut ports of New Haven, Fairfield, and Norwalk. Military and public stores, supply houses, and ships were destroyed, as were private homes, churches, and other public buildings. The raids were ineffectually resisted by militia forces. The raid was part of a larger strategy designed by the British commander in chief, Lieutenant General Sir Henry Clinton, to draw Major General George Washington’s Continental Army onto terrain where it might be more effectively engaged. The strategy failed in this goal, and General Tryon was criticized for the severity of the action by both sides. Although the raid had economic impact and affected military supplies, Clinton’s efforts had no long-term strategic impact. Following the entry of France into the American Revolutionary War in 1778, British forces in New York City were primarily concerned with defending the city and its important harbor. The military activity in the northern states was reduced significantly, and the armies of George Washington and Sir Henry Clinton warily watched each other in the New York area. Washington based his defense in New Jersey and at West Point, where he guarded critical communications and supply links. 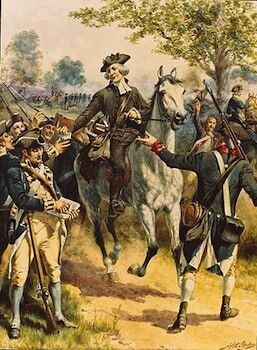 In 1779 Lieutenant General Clinton hatched a plan that he hoped would convince General Washington to move his army so that he might be engaged in a “general and decisive action”. He first launched an expedition in late May that seized Stony Point and Verplanck’s Point, opposite sides of a key crossing point on the Hudson River. Although Washington did move additional troops into the New York highlands, Clinton felt the position too strong to attack. He then decided to dispatch Major General William Tryon who organized an expedition to raid the coastal communities of Connecticut, while Clinton staged a body of troops at Mamaroneck, New York that would go after Washington when he moved troops to oppose the raids, and also attack Continental Army positions in New Jersey. Tryon assembled a force of 2,600 men, and embarked them on a fleet commanded by Sir George Collier. One division, led by Brigadier General George Garth, consisted of the 54th Regiment along with several companies of Royal Fusiliers, Foot Guards, and Hessian jägers. The second division, led by Tryon, consisted of the Hessian Landgrave Regiment, the Royal Welch Fusiliers, and the King’s American Regiment, the latter being a provincial regiment of Loyalists raised by Yale College graduate Edmund Fanning. Coordinates: 41°18′36″N 72°55′25″W) two days later. Immediately disembarking, Garth’s division rapidly gained control of New Haven, and went to work. Although Tryon had given orders that included burning the town, Garth did not do this; he limited his activities to destroying public stores, and seizing or destroying the town’s armaments and ships in the harbor. Tryon’s division landed in East Haven, where it met spirited resistance from a band of local militia, but managed to take Black Rock Fort. In addition to destroying barns filled with grain, Tryon had local manor houses put to the torch. By the time the British withdrew, over 1,000 militia had mustered from the surrounding towns. The expedition reembarked on the fleet on the afternoon of July 6, after having spent the night in armed camps. They sailed for Fairfield (41°10′33″N 73°16′19″W), arriving two days later. There the inhabitants fled upon the fleet’s arrival, and Tryon’s force, with little or no opposition, went on a destructive rampage. In addition to destroying 54 barns and 47 storehouses, they burned 83 homes, two churches, and municipal buildings including a schoolhouse, the courthouse and the local jail. After another night ashore, the expedition sailed across Long Island Sound, where it spent two days resting and resupplying in Huntington, New York. The fleet arrived at Norwalk (41°05′38″N 73°25′11″W), late on July 11. The troops did not finish landing until 3 am on the 12th, so they rested until daybreak. The two divisions, which had landed on opposite sides of the harbor, were weakly opposed by about 50 local militia, which were easily dispersed. The destruction then began, with most of the village and its commercial infrastructure destroyed. The fleet returned to Huntington, where on July 14 Tryon received orders to return to New York. General Clinton’s plan was an utter failure. 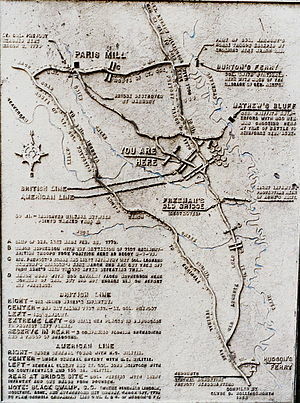 General Washington, on hearing of the invasion, immediately ordered the entire Connecticut division, stationed near West Point to move with all possible speed to counter the invasion. But they arrived after Tryon had sailed, and missed the opportunity to defend their own state. Washington however, may have benefited from Clinton’s weakening of the garrison at Stony Point in order to provide men for Tryon’s expedition; on the night of July 15–16 a picked force under the command of General Anthony Wayne successfully captured the outpost. Although Clinton reoccupied Stony Point, the failure of the 1779 raids to accomplish anything of substance led him to abandon it later in the year. The last raid by the British against the Connecticut coast was conducted by its native son, Benedict Arnold, in 1781, when he attacked the port of New London.